I have a small problem with stubbornness. I plan to do something and by darn I'm going to do all of it. Even at the expense of, well, health and sanity. Which is why I spent Sunday stumbling around the house in a fog of exhaustion. Because apparently I don't have the good sense to not start something at 5pm. 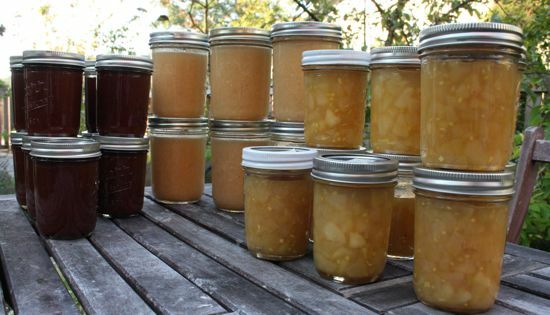 Saturday: one batch of Pear+Ginger Preserves, one batch of Pear-Apple Sauce (using up the rest of the fruit from the backyard), freezing three bundles of spinach, and one batch of spicy Chinese Plum Sauce. It's not Can-o-Rama by any measure. But then, I'm not done yet and I keep tucking the jars into the dark and unphotographable pantry as soon as they are properly cool. Maybe when I'm all done (post-peaches, hopefully) I'll post the total tally of all the canned, dried and frozen things. Or maybe not. I think Erica's amazing, in her own wonderfully crazy way. But I'm not trying to out-do her. Really. Next up: roasted red peppers, grapes, peaches. But in the winter, when you pull out a jar of preserves and the flavor bursts forth, all the exhaustion will be forgotten or if not forgotten, at least forgiven...a bit like childbirth, wouldn't you say? If I had anyone around who could and would actually eat the stuff, I'd be right behind you with apricot and strawberry jam and canned peaches!